With spring arriving soon, our range of Southern Star aluminium and Canterbury timber bifold doors are the best way to take advantage of the improving weather. Bifold doors are the perfect way to enjoy the great outdoors, even from inside. Whether you’re admiring the scenery of your backyard or entertaining guests with a barbecue, you’ll love the advanced features our bifold doors provide. Available in a variety of panel configurations, these concertina style doors fold back to the edges of the door opening, allowing uninterrupted access between indoor and outdoor entertaining areas. The perfect lifestyle solution for your alfresco living space, our bifold doors are available in aluminium from Southern Star Aluminium Windows and Doors, and Timber from Canterbury Timber Windows and Doors. 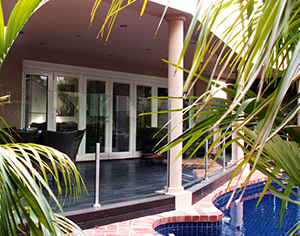 The Southern Star range of aluminium bifold doors offers design and functional excellence with stunning modern style. Offering maximum open space for seamless indoor/outdoor living, and available in 100, 200 and 300 series styles, our aluminium bifold doors are available in a number of powder coat colour options. The Canterbury timber bifold door has the same superior functionality and opens up your home within seconds for the ultimate in indoor/outdoor entertaining. Available in a choice of timber from Meranti, Western Red Cedar and KD Hardwood, the Canterbury Timber bifold door can be hinged on either side of the frame. Both the aluminium and timber bifold doors are available as corner unit options, and can be provided in an open in or open out configuration to suit and maximise available outside area. Check out our website, visit a showroom or speak to a friendly sales team member to find out more about our fantastic range of bifold doors.